Britain's parking restrictions have become the bane of every motorist's life. Running parking regimes has become a big business, with private companies operating the system across the country, but is it right to make money out of enforcing the law? It's surely one of the most infuriating things in modern life - returning to your car only to find a parking ticket tucked under the windscreen, and sometimes just because you overran the meter by a couple of minutes. With fines of up to £100, it can be expensive as well as annoying. Many local authorities around the UK have taken charge of running street parking, and some have contracted out the operation to one of a number of private firms like NCP and APCOA. 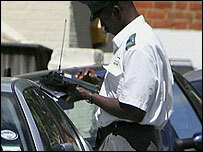 It's becoming a multi-million pound business - last year alone more than £1bn was collected from Britain's motorists. The public image of these privatised parking regimes has not been helped by a series of tabloid stories. Is this a safety or a money making measure? Like the one about the man returning from holiday to find double yellow lines painted around his car, or the one about the RSPCA officer getting hit with a ticket whilst trying to rescue some ducks stranded on a high ledge. 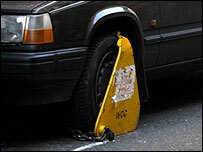 For many people, coping with parking restrictions and avoiding the wardens is like a constant game of cat and mouse. Courier driver Colin Rees does about 10 delivery drops a day in central London, and often he has to park on single and double yellow lines. Each time he has to watch out for parking attendants, and he also has to get to grips with the ticketing rules, which can vary from borough to borough. "Just got to take a chance really," he says. But he and his fellow drivers at "On-Line Couriers" aren't always successful. The firm gets around 100 tickets every year. So how did we come by a parking system that many motorist believe to be unfair? Street parking violations used to be a criminal offence, and as such were enforced by local police. But with so many other more serious matters to deal with, the police didn't always enforce the rules. The Road Traffic Act of 1991 changed all that, allowing local councils the option to takeover the policing of parking, and more importantly, allowed them to keep the money. Suddenly there was an economic incentive to deal with all offences more rigorously. In the mid-1990s, 33 London boroughs became the first to manage their street parking. Some employed their own newly named Parking Attendants, others signed contracts with firms who would hand out penalty charge notices, fit clamps and tow away vehicles. They quickly found they could make money out of it. Westminster, Camden and Kensington and Chelsea were soon recording huge cash surpluses running into millions of pounds. Motorists and the media were quick accuse the local authorities of being more interested in making money than in keeping the traffic running freely. 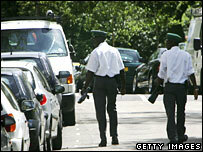 There were also suspicions that some authorities and contractors were operating targets for numbers of tickets issued. Councils are only supposed to spend any surplus cash from fines and charges on road improvements, public transport schemes and environmental improvements. But some of the definitions appear to be quite broad. For example, Westminster spent more than £700,000 last year on hanging baskets and street trees. The council says that it's not using parking to raise revenues, and hanging baskets make Westminster a pleasant place to live, but should they really be spending money on those kind of things when there appears to be a lot to do to improve the roads and public transport in their area? Motorists' lobby RAC think the money could be better spent and feels that hanging baskets don't do anything for road safety and don't do anything for traffic management. As more and more local authorities opt to run parking enforcement, there will be more calls for controls on how it is policed and thus the debate over parking seems set to continue. The councils and contractors argue that decriminalised parking helps traffic to flow better, but it certainly feels to many motorists as if it is a system for making money. The Money Programme: Parking Mad, BBC Two at 7pm on Friday 4 August. In Northern Ireland, BBC Two at 10pm.